Lawrence Police Sgt. Amy Rhoads and Cymphonique, 3, greet Santa at Walmart in northwest Lawrence before doing some Christmas shopping Friday, Dec. 7, 2018. Local law enforcement members from the Douglas County Sheriff's Office, the KU Public Safety Office and the Lawrence Police Department paired up with children from the Ballard Community Center as part of the annual Take Our Youth Shopping event. 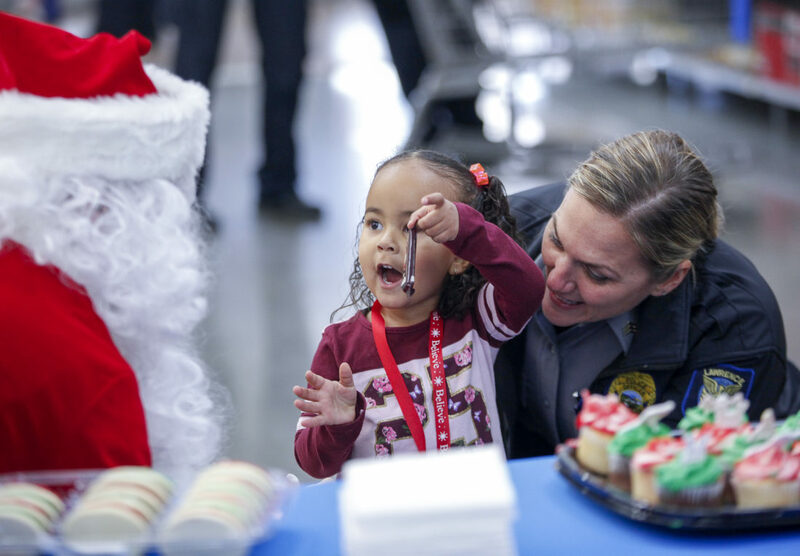 Local law enforcement members from the Douglas County Sheriff’s Office, the KU Public Safety Office and the Lawrence Police Department paired up with children from the Ballard Community Center as part of the annual Take Our Youth Shopping event, Friday, Dec. 7, 2018, at Walmart, 550 Congressional Drive, in northwest Lawrence. 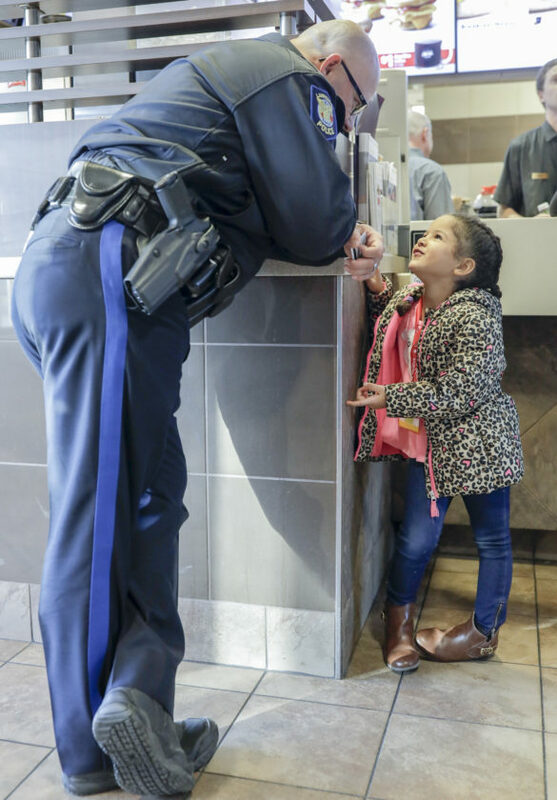 Lawrence Police department detective Larry Hamilton opens up a container of milk for Aviana as the two have breakfast at McDonald’s before heading to do some Christmas shopping at Walmart in northwest Lawrence, Friday, Dec. 7, 2018. 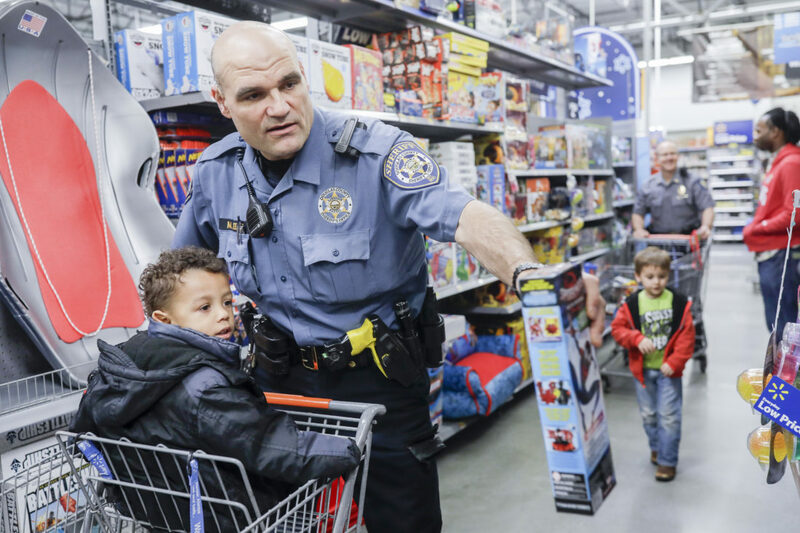 Local law enforcement members from the Douglas County Sheriff’s Office, the KU Public Safety Office and the Lawrence Police Department paired up with children from the Ballard Community Center as part of the annual Take Our Youth Shopping event. 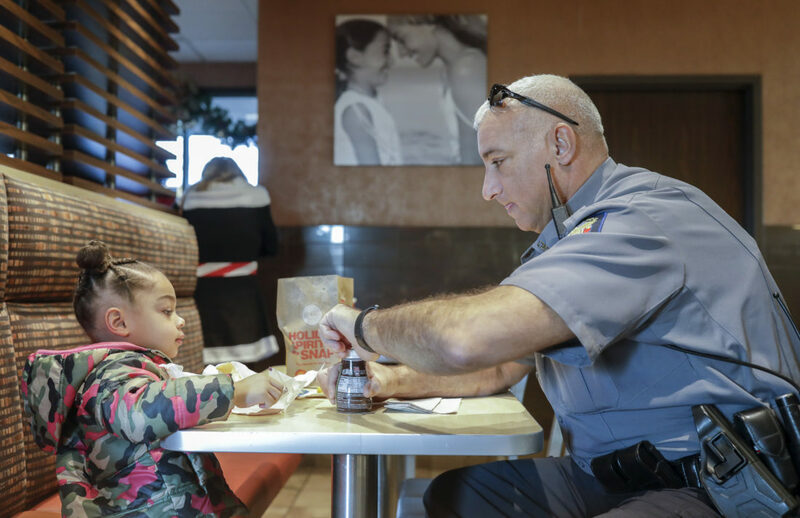 Lawrence Police Detective George Baker visits with Mia, 5, as the two wait for their breakfast at McDonald’s before heading to do some Christmas shopping at Walmart in northwest Lawrence, Friday, Dec. 7, 2018. 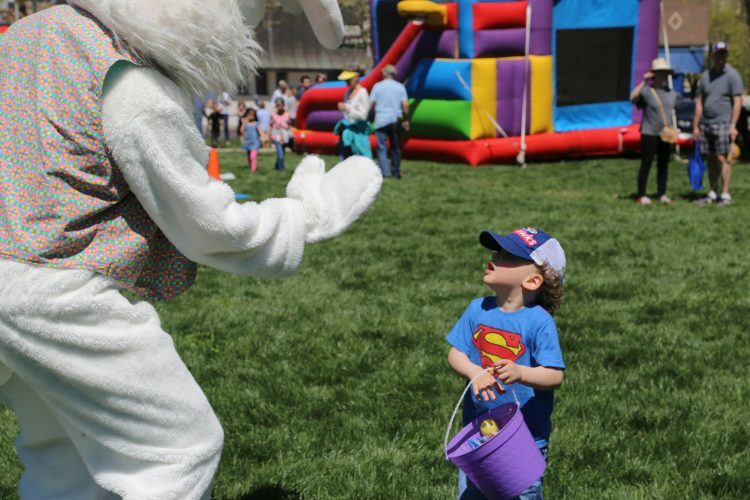 Local law enforcement members from the Douglas County Sheriff’s Office, the KU Public Safety Office and the Lawrence Police Department paired up with children from the Ballard Community Center as part of the annual Take Our Youth Shopping event. 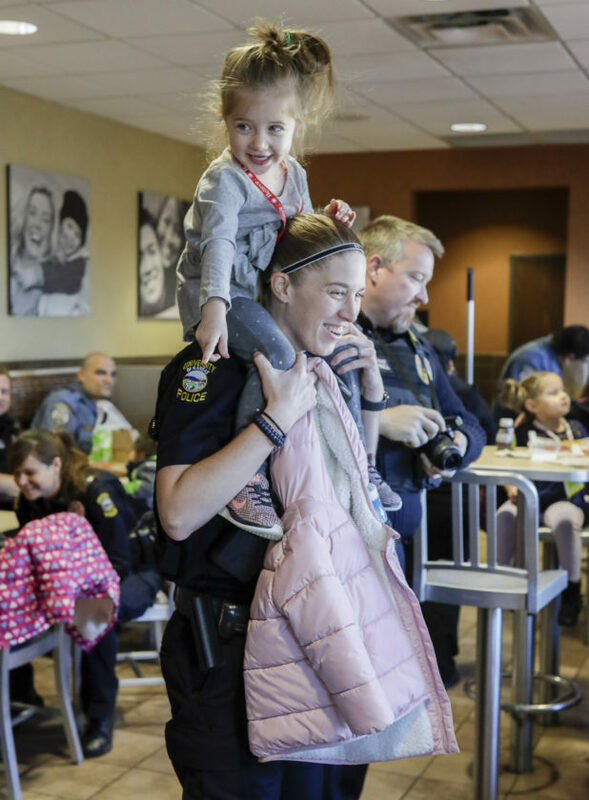 University of Kansas Police Officer Cortney Coke carries Kali, 3, during a breakfast at McDonald’s before heading to do some Christmas shopping at Walmart in northwest Lawrence, Friday, Dec. 7, 2018. Local law enforcement members from the Douglas County Sheriff’s Office, the KU Public Safety Office and the Lawrence Police Department paired up with children from the Ballard Community Center as part of the annual Take Our Youth Shopping event. 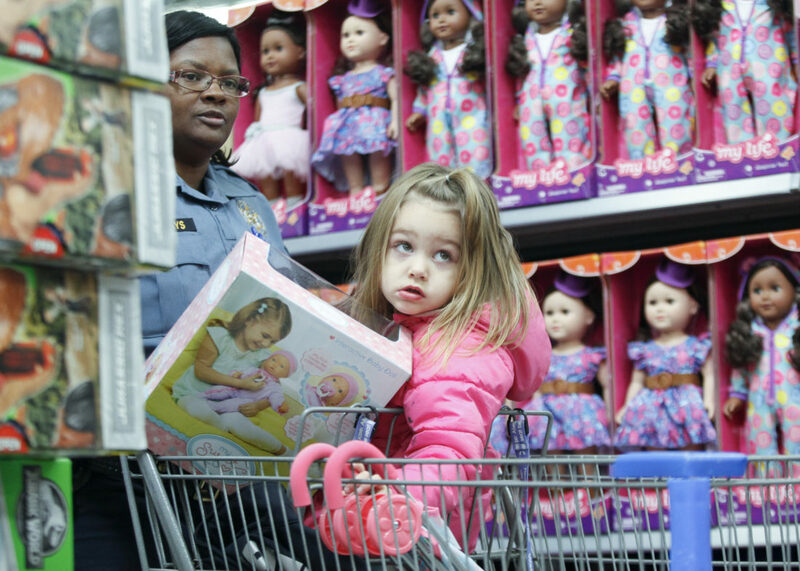 Adalyn rides through the toy aisles at Walmart, pushed by Douglas County Sheriff’s Office Detective Rita Fulton during a Christmas shopping trip Friday, Dec. 7, 2018 in northwest Lawrence. 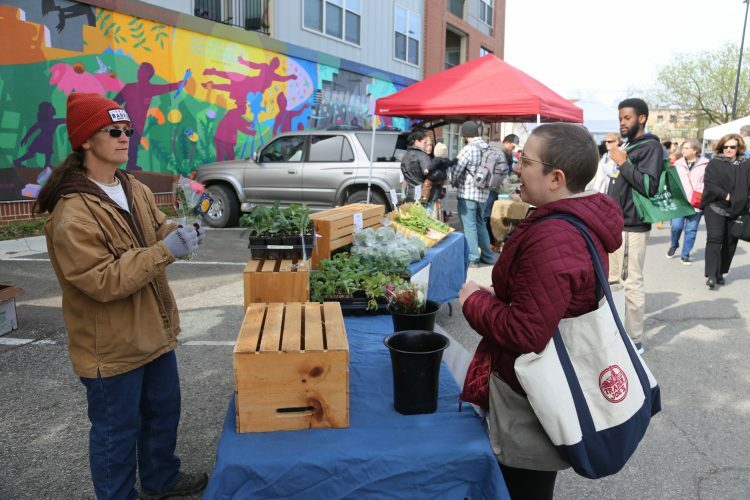 Local law enforcement members from the Douglas County Sheriff’s Office, the KU Public Safety Office and the Lawrence Police Department paired up with children from the Ballard Community Center as part of the annual Take Our Youth Shopping event. 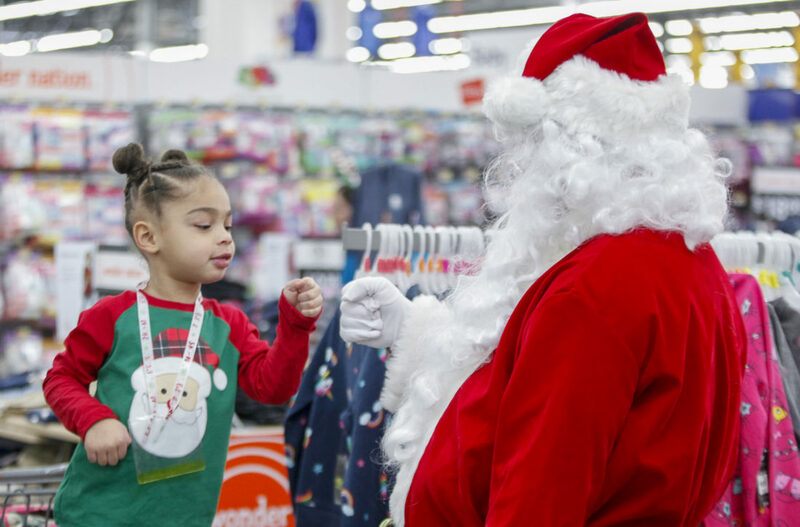 Aviana does a fist bump with Santa during a Christmas shopping trip at the Walmart in northwest Lawrence, Friday, Dec. 7, 2018. Local law enforcement members from the Douglas County Sheriff’s Office, the KU Public Safety Office and the Lawrence Police Department paired up with children from the Ballard Community Center as part of the annual Take Our Youth Shopping event. Lawrence Police Sgt. 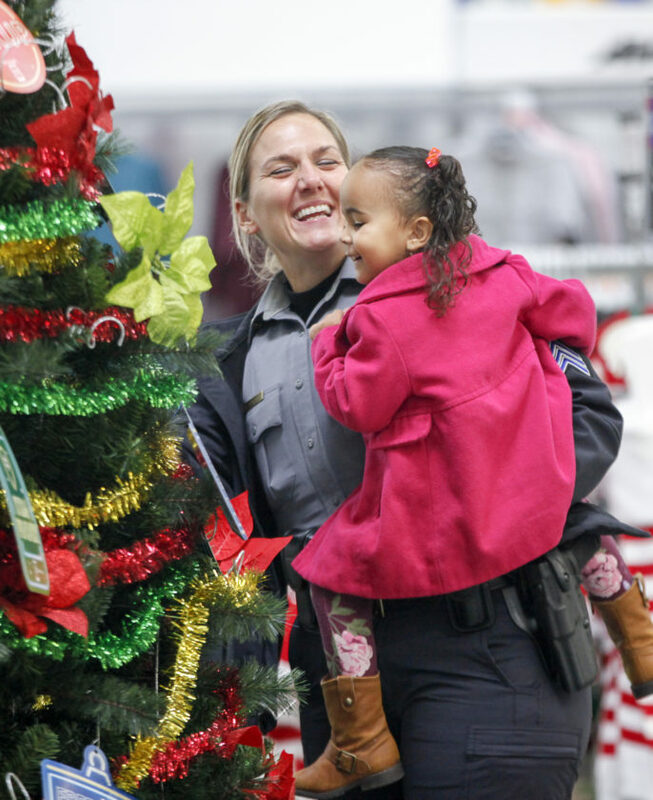 Amy Rhoads and Cymphonique, 3, enjoy looking over a Christmas tree at the Walmart in northwest Lawrence, Friday, Dec. 7, 2018. Local law enforcement members from the Douglas County Sheriff’s Office, the KU Public Safety Office and the Lawrence Police Department paired up with children from the Ballard Community Center as part of the annual Take Our Youth Shopping event. Douglas County Sheriff’s Deputy Mike Steele shops for toys with Jayden, 2, at Walmart in northwest Lawrence, Friday, Dec. 7, 2018. Local law enforcement members from the Douglas County Sheriff’s Office, the KU Public Safety Office and the Lawrence Police Department paired up with children from the Ballard Community Center as part of the annual Take Our Youth Shopping event.